This feature provides your Certified Repair business with a state-of-the-art quality assurance system to monitor manage and track your repair quality. OE-QC includes a Smart App interface for technicians to quickly and efficiently document their use of OEM repair procedures. Also features an estimate-driven quality control checklist (Q-check). This feature provides your Certified Repair business with complete control and a copy of all of their business data. Includes key features such as dataIQ and dataSafe. This feature provides your Certified Repair business with Amazon cloud-based, safeguarded data storage to track reporting, KPI, customer relationship management and marketing, and rebate program participation. 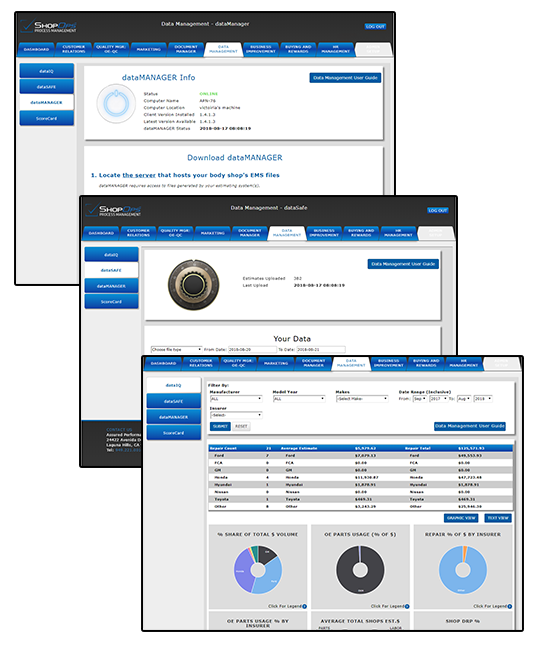 This feature provides your Certified Repair business with a comprehensive internal data-driven KPI dashboard for shop self-management including push reports that keep everyone informed of your business’s overall performance. The system also allows for self-evaluation, comparative benchmarking, and OEM reporting. This feature provides your Certified Repair business with a business development system allowing shops to evaluate business performance, execute a business improvement plan, and create financial projections. This exclusive feature provides your Certified Repair business with an “electronic operations manual” ...it’s a repository for all of your shop’s operating processes, procedures, checklists and forms. ...It’s filled with pre-written templates .. even job descriptions that can be edited and customized to fit your specific business needs. 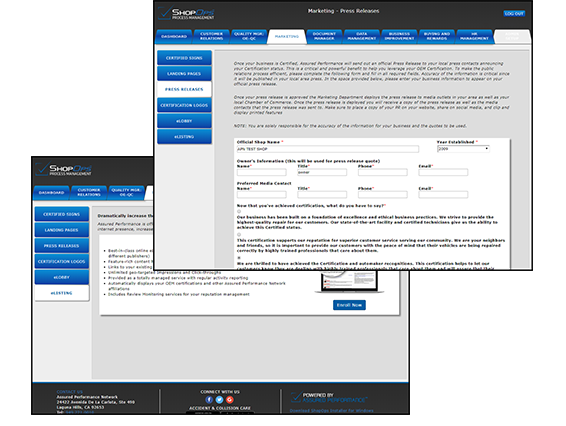 This exclusive feature provides your Certified Repair business with a customer relationship management system (CRM) and contact manager. Includes direct marketing tools, instant messaging, and customer/ contact history with automated follow-ups and reminders. Its organized the way you need it to be to manage your customer bank of thousands of past customers, vendors, contacts and more. Now, you have a state-of-the-art tool to own those valued customers and keep them coming back. Your Certified Repair Business is displayed and promoted across numerous OEM online shop locators and in smart app for consumers, agents, appraisers, and insurers. This exclusive feature is a turnkey system that enables each Certified shops to have a stylize and highly presentable and professional online locator landing page (microSITE) for all of the online locators and smart apps. Follow the guide, upload images and they system does the rest! Now you have your own TV channel and message center right in your own Lobby! 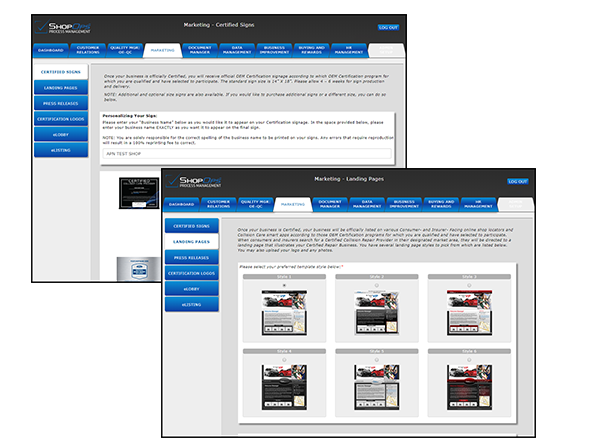 This feature provides your Certified Repair business with a waiting room video, electronic signage, and consumer education videos from the Automakers themselves... all to help you close more sales and elevate your customer retention & satisfaction. Now you control the message! It’s an exclusive and affordable OPTIONAL service that ensures your business is listed and promoted properly on all of the OVER 70 top web search engines so consumers and everyone else can find your business. It’s essential in today’s social media-driven world!